Details Being a dentist is my vocation. 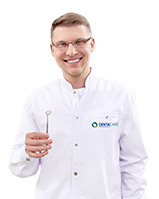 I chose this profession early on in my education and fulfilled my dream by obtaining a degree in medicine and dentistry from the Medical University of Warsaw. The commitment and passion I bring to my work allow me to precisely plan and implement comprehensive treatment programmes, which gives me great satisfaction and provides my patients with healthy smiles and improved well-being. My daily work involves conservative treatment and prosthetics, in particular aesthetic tooth reconstruction. I ensure an interdisciplinary approach to the patient, consulting with other specialists on special cases, so that the patient receives comprehensive and personalised dental care. It is very important for me to have a good rapport with patients and ensure they are satisfied with the end result.